Mrs CFS is becoming very generous at the moment and is allowing me to go activating on a very regular basis. We are starting to watch our weights a little so she sees this as good exercise for me. Who am I to argue! I had 3 possible target areas to travel to. 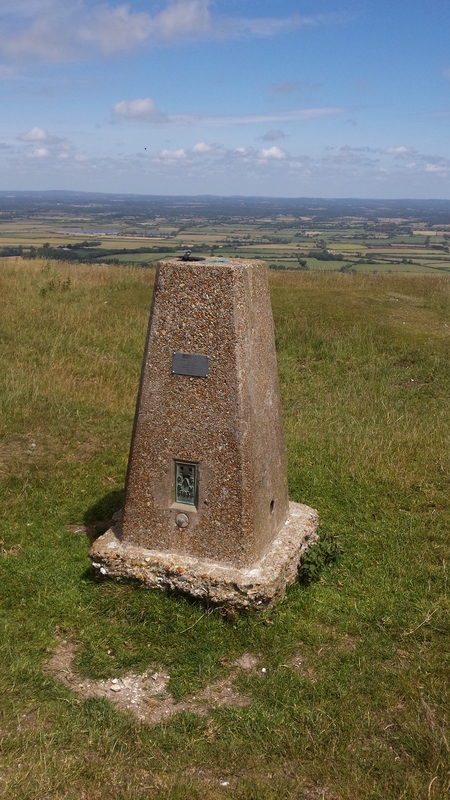 The first is the SE summits that border the M25, then there are the SC summits around Beaminster and Bridport, and finally the 3 SE summits immediately to the west of Eastbourne. 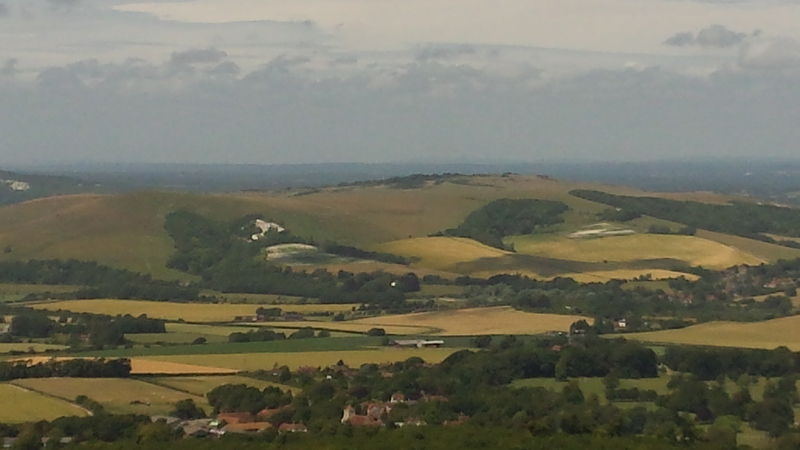 Yes I know there are 4 SE summits immediately west of Eastbourne but Ditchling Beacon is reserved for when I take my XYL to Brighton for some beautification. 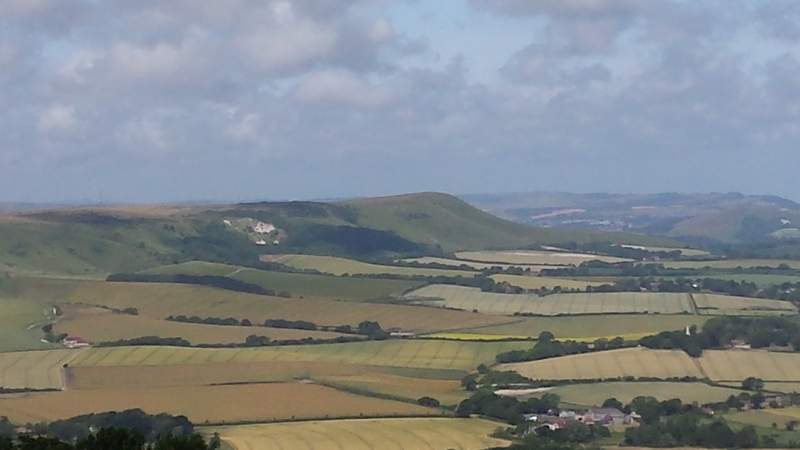 The 2 SC summits will be activated when I take my Mother in Law and her friend through to Weymouth in a couple of weeks time and I quite fancied the South Downs on a sunny warm day so it was off to Wilmington Hill, Firle Beacon and Cliffe Hill just to the west of Eastbourne. FT-817 5W, 2Ah SLAB, linked dipole 60m, 40m & 20m on 7m SOTA Pole and palm paddle key. Left home at 07.15 for the 1hour 50 minute drive to Wilmington Hill car park. After an uneventful drive I parked up in the car park at TQ 531032 and set off up the South Downs Way (SDW) path across the road. 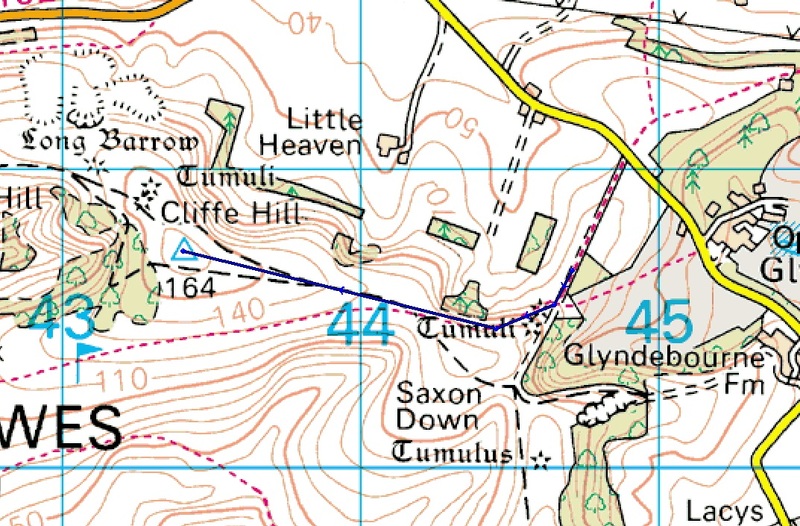 The path is easy with a steady rise in elevation however, at the point where the SDW heads south to skirt the hill I struck out straight for the top of the ridge followed by a short walk to the trig point. There is a fence running along the north edge of the hill within 20 feet of the trig which made the ideal place to make camp. Distance travelled 1.2 miles, ascent 477 feet, time taken 30 minutes. A quick check of Sotawatch sent me to 60m for a S2S with Mal GW6OVD/P on Garth Hill G/SW-034, one more QSO was made on this band before self spotting on 40m SSB. 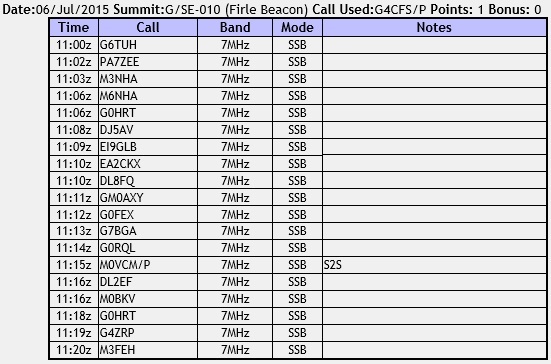 6 contacts were made on a very poor band with limited propagation and heavy QSB. After calling a few times with no reply it was a quick pack up and off back to the car. The journey down only took 20 mins allowing enough time for a cup of coffee and half a sandwich. 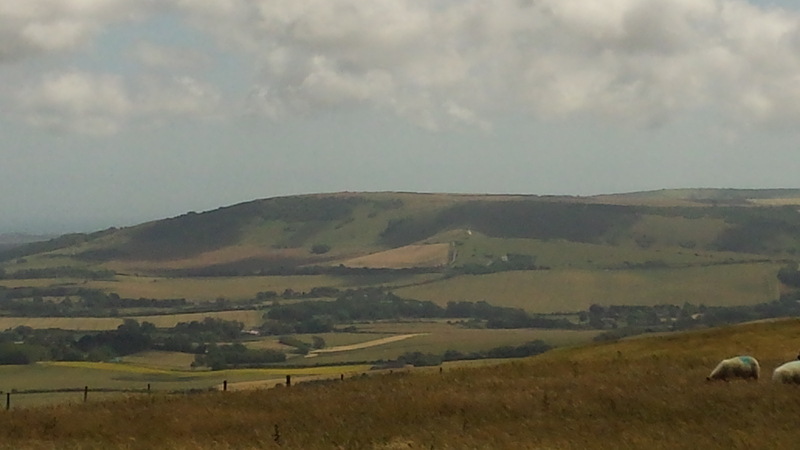 The South Downs Way can be seen going to the right – head straight up the hill to the trig point. The drive from Wilmington Hill took just 12 minutes along the A27. 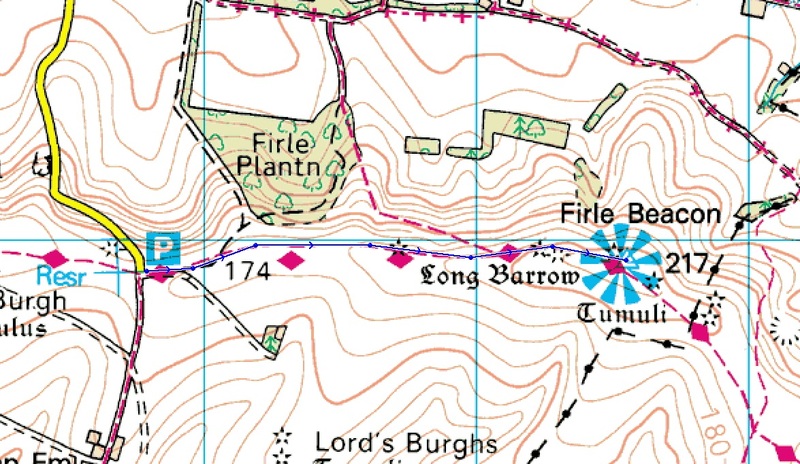 Make sure you turn off for Firle Village and Palace then as you enter the village take the right fork sign posted Firle Beacon. This road takes you right up onto the ridge and a sizable car park TQ 468058. Of course because of the easy access and large car park this is a very popular hill and even on a Monday during term time there were about 10 vehicles parked up. The walk to the summit is a gentle rising path commanding magnificent views to the north and south. 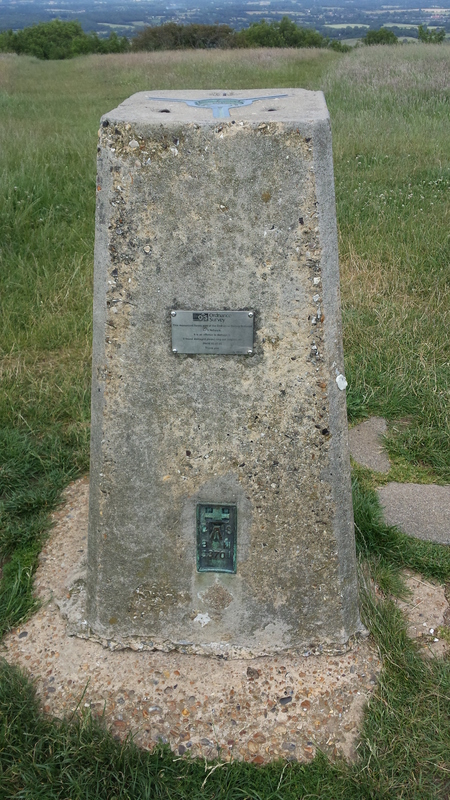 Again, as with Wilmington Hill, there is a fence within 20 feet of the trig point ideal for the mast support. The fence is also about 50 feet away from the SDW footpath so I remained slightly out of sight and undisturbed. Distance walked 1.2 miles ascent 161 feet time take 20 minutes. This time started on 40m SSB with a self spot and straight back to my first call came Mike G6TUH who lives just down the road. It became clear that the bands had improved slightly and this was borne out by the size of the pile up. Overall 18 QSO’s were completed in 20 minutes before the contacts dried up. This included a S2S with John M0VCM/P on Hutton Roof Crags G/LD-052 and 6 DXCC or 7 if you include Karl M3FEH in Cornwall!! The sun was now starting to get high in the sky and the heat was rising but the gentle southerly breeze was most welcoming. It was interesting to hear all the reports of rain across the UK whilst I was basking in sunshine, blue sky with about 1 okta of cloud. The next summit was even closer, close enough to have facilitated communication by semaphore or aldis lamp. So it was back into the car and off to Cliffe Hill. 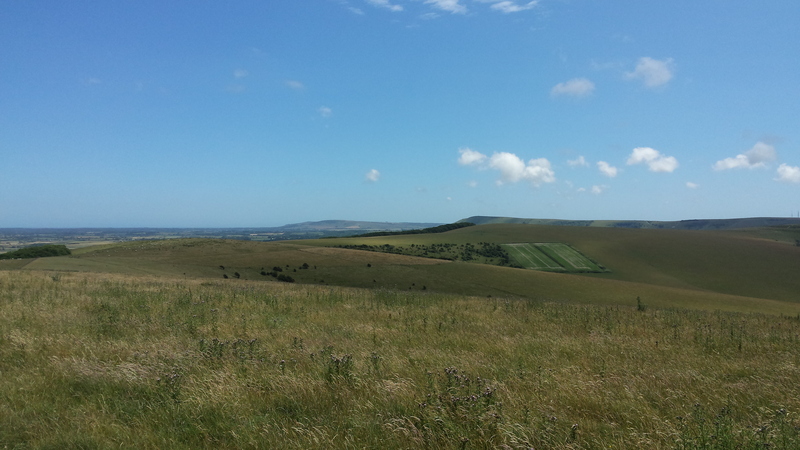 As I drove up though Glynde towards Glyndebourne I became a little concerned about the fact that there had been a festival at Glynde Place and that there were a number of police signs saying this road was a ‘tow away zone’. However, once I got as far as the opera house the signage had gone away and it was back to normal. Just under half a kilometre past the opera house is a turning on the left into an unmade track, single file wide. The surface looked good enough and I had read of some amateurs driving up this lane. The drive was OK for my Avensis and I got to the turning/parking space about three quarters the way along the track. From here is was over the style and I took the track heading up to the right along the edge of the woods. Clearing the woods the track continued up hill towards the Lewes Golf Course which occupies the summit. Entering the golf course I tentatively made my way to the trig point. However, having had a near miss from an errant golf ball, I decided that discretion was the batter part of valour and made my way off of the golf course but remaining within the AZ. Distance walked 1 mile, ascent 275 feet, time taken 22 minutes. Using the boundary fence of the golf course to support the mast, I was about to put out a self spot when Mike G6TUH calls me up to see if I have arrived yet. He must have a sixth sense which became even more scary later. I opened up on 40m SSB and again the conditions had gone down hill but still managed to get 8 QSO’s in the bag before the band went very quiet. It was at this point that I realised that I still had plenty of time left on my day pass so I made the decision to go to Ditchling Beacon G/SE-006 as it was on the way home. A quick pack up and off back to the car. I have mentioned before that when I lived in Scotland I would go out all day to activate 1 mountain whereas in the south of England I now have to do 3-4 summits (pimples) in a day to make it worthwhile. One advantage this has is that I am now becoming very proficient at making and breaking camp fairly quickly, something that will become very handy when the weather starts to deteriorate. As I said at the start, this was going to be activated at the end of July whilst my XYL was having some beautification in Brighton. Well plans were meant to be changed and whilst I was this close and passing it made total sense. In hindsight it worked out better because I have been trying to work out how to activate Crowborough without having to make a special journey just for that one summit. Well problem solved, that is the target now for the end of July when my wife is in Brighton. 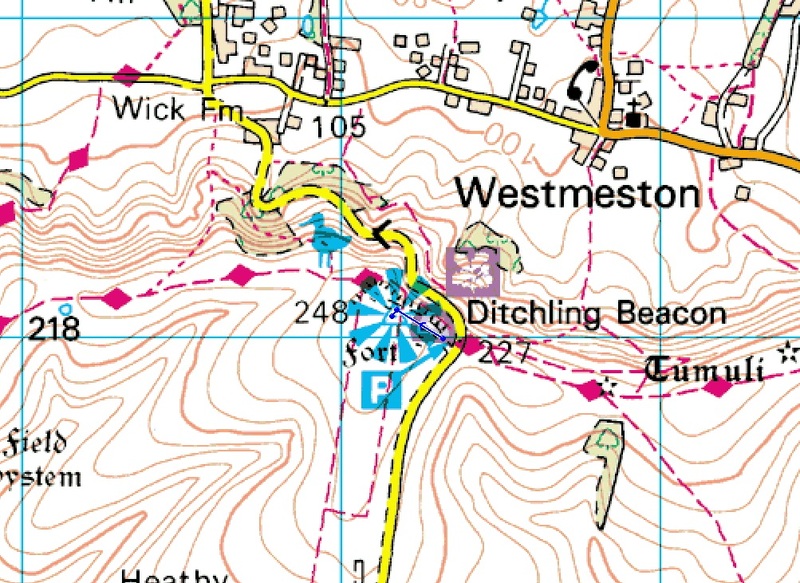 Ditchling Beacon was about a 20 minute drive from Cliffe Hill and I got parked up in the NT car park along with a about 20 other vehicles. One of the other vehicles just happened to be an ice cream van so a 99 was enjoyed before setting of on my mammoth journey to the trig point. 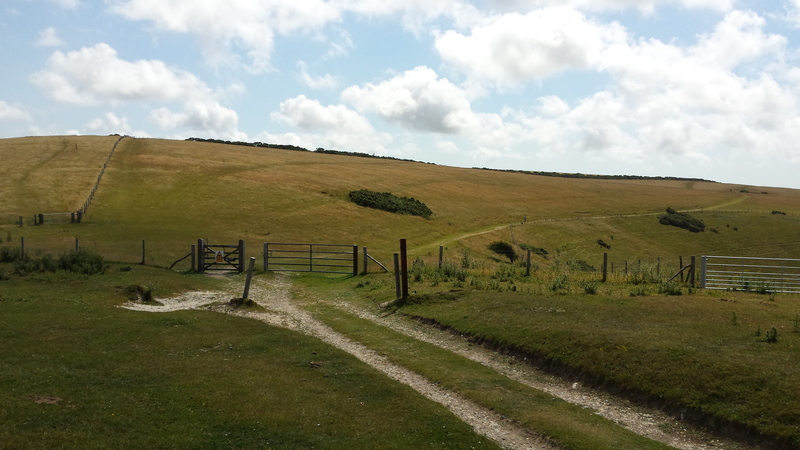 Ditchling Beacon is a nature reserve and the main footpath headed straight off into the wilderness completely bypassing the trip point. 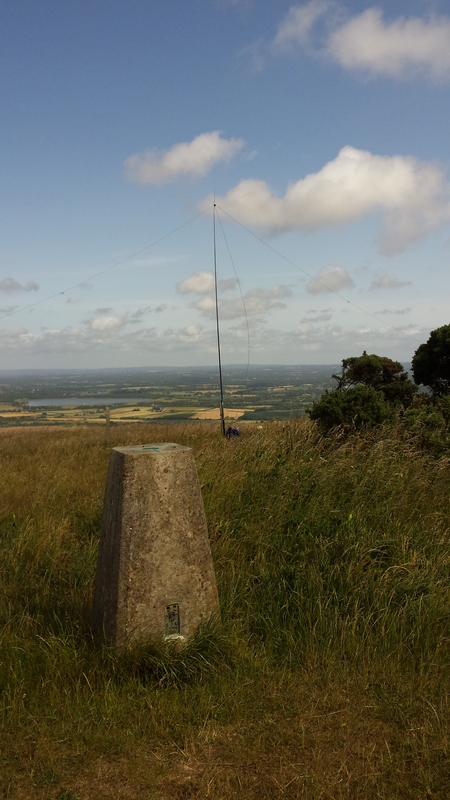 So it was possible to get next to the trig and use the adjacent fence to support the mast. Again a quick assembly and I was ready to go. Distance walked 600 feet ascent 45 feet time taken 3 minutes. I thought, for a change, I would put a call out on 2m FM. After a couple of calls I got Al G4RUL in Eastbourne but no one else. 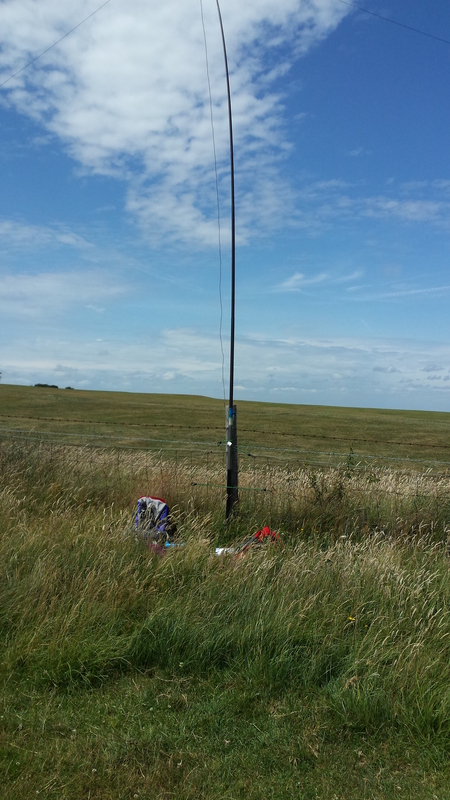 So it was off to 40m SSB but unfortunately the frequency I had been using all day, 7.123 MHz, was now occupied. A tune around was made and a new QRG was selected, 7.165 MHz, and a quick unannounced CQ SOTA call was made. Now for the scary bit, earlier I had said that Mike G6TUH had a sixth sense, well this proved it because after the one quick CQ Mike came straight back to me for a report and a quick chat. I told Mike that I was probably low on battery power (I had only planned for 3 activations so had a 2AH battery) and wanted to qualify the hill before it died. So Mike kindly spotted me stating my battery was low and I was able to manage 10 more QSO’s before the battery finally packed up. All in all it had been a great day out. I had managed to activate 4 SE summits and prove that Mike is in league with the ‘dark side’. The band conditions were at best very poor but this didn’t prevent me from easily qualifying all the hills. 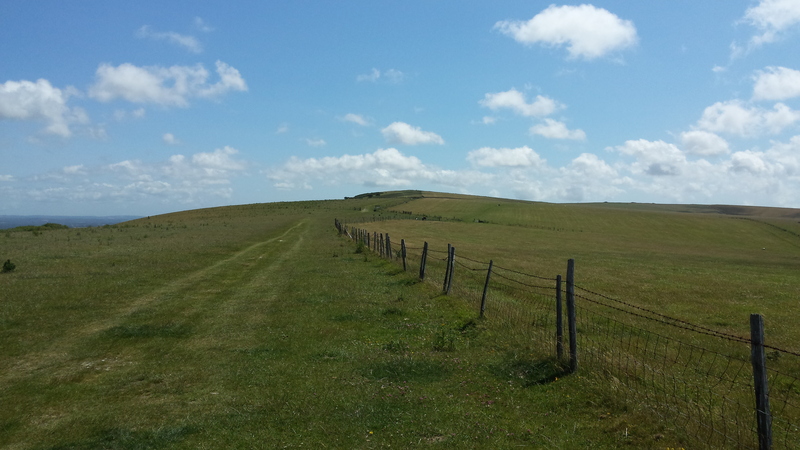 The scenery and weather had been fantastic and I had experienced the South Downs at their very best. 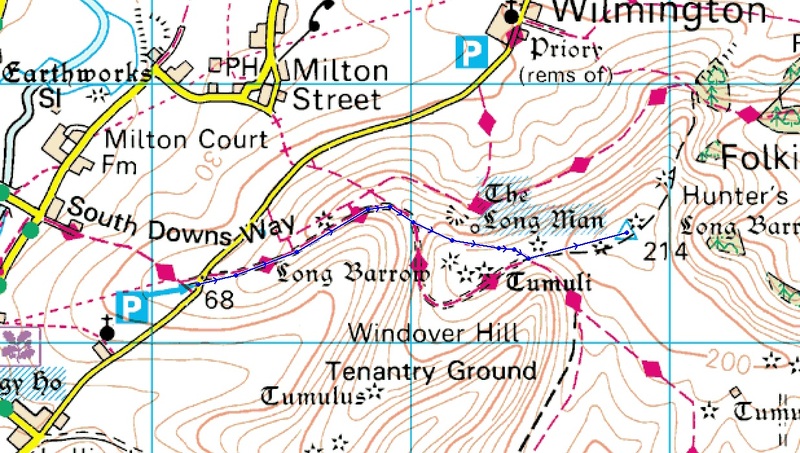 I would like to mention and thank Mike G6TUH, Damian M0BKV, and Jim EI9GLB who all managed to work me on all 4 hills. Also to Don G0RQL and Geert PA7ZEE who both managed 3 of the 4 hills.